Home » 2013 » April » 11 » BLOODSHOT! This is none other than the Regal Horned Lizard or to be more specific, Phrynosoma solaris. Regal means of notable excellence or magnificence and it can be clearly described by the appearance of this lizard. They can be found mainly in Southern Arizona, United States, and inhabit valleys, rocky areas, and low foothills. It is also found in relatively level areas with exposure to sunlight. Despite its majestic appearance and intimidating looks, this lizard does have an intriguing behaviour that would bewilder one completely. Yes! I mean BLOODSHOT literally! It really enthralled when i first saw this on a video from YouTube. Amazing but true, this small reptile has the ability to squirt blood out from it’s eyes to confuse predators preying on it, increasing its chance of survival! Kierzek, M. 2000. “Phrynosoma solare” (On-line), Animal Diversity Web. 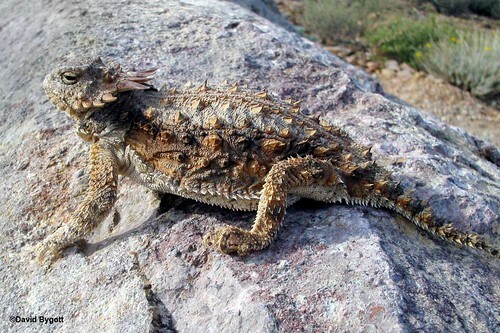 “Without the use of a blood-squirting defense and its presumed delivery of noxious chemicals … a horned lizard may have little chance of surviving an encounter with a canid…. With a blood-squirting defense a lizard’s survival chances increase, probably substantially…. What a showcase of incredible talent and natural selection! for those more interested to see this in more details click on the video link below! 🙂 cheers! ← A Wild Leap of Faith!